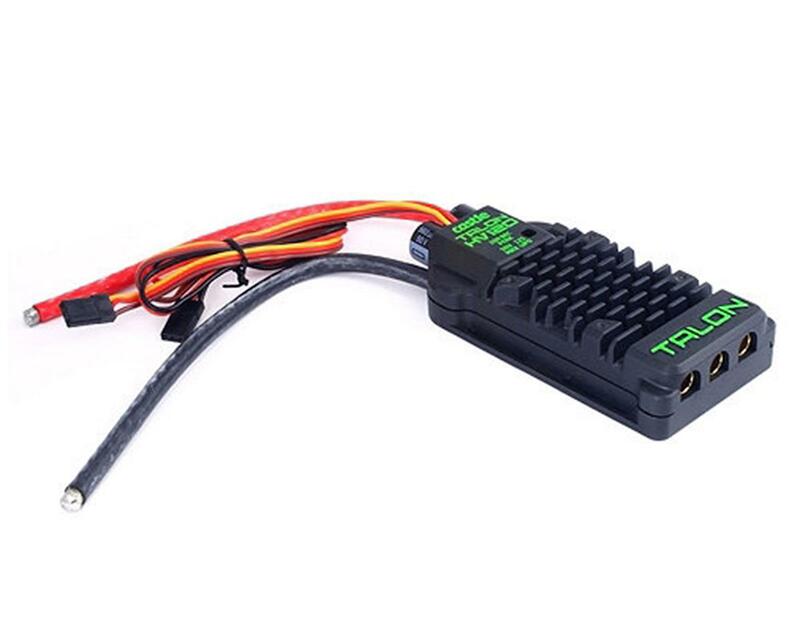 This is the Castle Creations Talon 120HV Brushless ESC. The Talon HV120 has the power in all the right places, and the looks to match. The first high voltage controller to come out of the Castle factory with a built in BEC deserves nothing but the biggest BEC we could muster. No more reaching for an external BEC or messing with extra wiring. At the heart of this powerhouse sits a 20A peak BEC** with selectable 6v or 8v output voltage. With a voltage input range from 3S to 12S LiPo, and a 120A* continuous amperage capability, it’s capable of up to 6000W of continuous power for a wide variety of heli and fixed wing applications. Its sleek aluminum case not only ensures your Talon HV stays cool during high power demand situations, but also looks the part while doing it. For those seeking optimum cooling performance, we are offering a 40mm fan accessory, it is recommended for set ups with low airflow, such as under canopies or in a fuselage. Talon HV users will have access to our industry leading software functions and USB programming capability via Castle Link USB adapter***. *RC HOBBY APPLICATION RATING: 120 amps for the duration of a single 10,000 mAh battery pack with the ESC in contact with a 5 mph airflow of 25C (77F) or cooler air. Controller temperature must never exceed 100C (212F). Exceeding current or temperature ratings may damage components and may shorten the life of the ESC. Always verify system current draw at fullthrottle. Decrease load or increase airflow to decrease the ESC’s operating temperature. Setup - Power 160, Talon 120HV, 10S w/19x10 in Hangar 9 DHC-2 Beaver 1/4 scale. Note - Powering receiver via ESC lead and powering LED controller with separate BEC lead. Manual doesn't specify if ESC lead is 'opto' so I was happy to learn that that both leads are powered. ESC is super smooth and never even gets warm I my setup. I have the older Edge 120HV in the exact same setup in another plane and the Talon seems every bit as cool, although a bit heavier. Over all, I dig this setup with integral BEC Pro. Would buy again. LOVE this unit! Power all day in my Goblin 570 KSE. Powerful BEC and smooth response!